This time I'm talking about men fashion, first things attracts me in a man and I make sure to check out whenever I encounter a hot dude are : His smile; as his teeth would say alot about him smoker or not too,His Hands; clean fingernails & last his shoes ! I believe footwear says alot about a man, don't think its the last thing to check NOPE its very significant a dude with a proper pair of shoes or even sandals so a dude with a scruffy pair of a shoes is a lost cause to me! 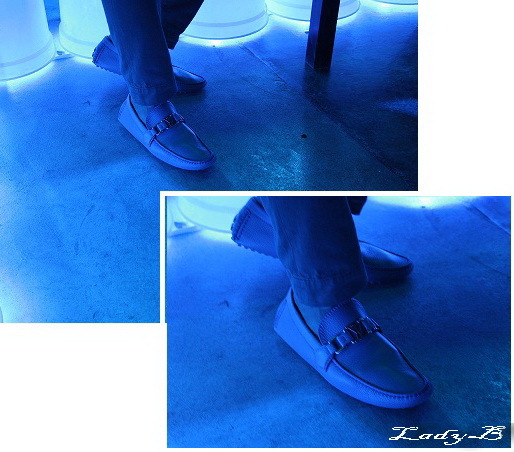 Baby Blue Louis Vuitton Loafers that's a winning package! Although I am more of a cufflinks/tie person who thrives to find the elusive combination for my work attire, I must say such posts are very informative, would be interesting to see more of them. Not sure if I ever commented on any of your earlier posts, but I enjoy reading your posts, keep up the good work and stay original.